Here are the offers for Gold Cup Day (Friday) of Cheltenham. Earn free bets, get money back and receive extra winnings with these promotions. It’s the final day of the Festival and we’ve had some cracking offers. We have been live-blogging offers throughout the week. This will be our fourth consecutive year of doing so, and it has been incredibly popular in previous years. Bet £10, and William Hill will give you 3 x £10 free bets when you visit via My Betting Sites. Terms and Conditions New William Hill online customers only. Min. unit stake of £10/€10 at odds of 1/2 or greater. Only the “win” part from EW bets will count. Free bet terms, payment method & country restrictions apply. Free bets credited as 3 x £10/€10. Free bet stakes are not returned as part of the settlement of successful free bets. All Free Bets must be wagered within 30 days. Looking for more new customer offers? Take a look at our homepage which lists the best betting sites. These offers are available to both new and existing customers. All bookmakers have revealed their offers for day 4 now. Coral is the first to announce their leading offer for Cheltenham. You can get double winnings on the first race (1.30pm) every day and it will be paid as cash. There is a maximum of £25 extra you can win and it applies to the first bet you place on the race. If your hose loses in the first or last race at Cheltenham each day, then Betway will refund your losing stake as a free bet. You can get maximum money back of £10. You can do this for both races each day. There is one final money back special from Paddy Power for Cheltenham and it’s for the first race of the day. Paddy Power are paying money back on all losers if Sir Erec wins the 13.30. He is priced up 1.8 currently to win this race, which gives him a 55% probability he will win. The rest of the field have much longer odds and is more open. This would be a good bet to use for an outsider. Pre-race singles bets only. There is a maximum free bet of £10 available. For first race each day, if you back a horse to win and it doesn’t come in, but it does finish within place terms, then NetBet will refund your losing stake as a free bet. There is a maximum of £10 that can be awarded, and importantly, you must opt-in to receive the offer. Another offer from William Hill. This one is a competition and you can potentially win £1m. Bet £10 outright, or £5 each way on the qualifying race to enter. You then have to pick the first six finishing horses and their order of them. Get it correct, and you can win a share of £1m. If no one gets it correct, then £50k is shared among those who correctly predict the top two. It’s the last race of the day for the Golden Race competition on Day 4 – the 5.30 Martin Pipe Handicap Hurdle. Unibet are rolling out their popular ’15 to go’ offer for Cheltenham and is available for all televised races. Back a winner, and you’ll get a free bet equal to your stake for the next race. Back a winner with £20 and you’ll get a £20 free bet for the next race. It’s similar to the Betfair, and bet365 offers listed below, but with two key differences. One difference is that you must place the bet within 15 minutes of the race starting. The second is that the qualifying minimum odds is just 2.00. It’s this latter difference which means you can effectively back favourites and be more likely to win a free bet additionally. Available from 5th March. You’ll get money back if your horse finishes 2nd or 3rd to the starting price (SP) favourite at any race during the festival. This will be paid as a free bet, up to £20. The 2nd place refund applies when there are 5+ runners, and 3rd place refund applies when there are 8+ runners. If you place multiple bets on a race, it is the first bet that is eligible for the offer. Back a winner at odds of 3/1, and Betfair will be giving you a £50 free bet. There is no limit on the number of free bets you can earn during the Festival. Previously, this has been capped at £25 but it has been doubled for Cheltenham. You’ll receive your free within 2 hours of the bet settling, so you might not get it in time for the next race. This is similar to Betfair, but with slightly longer odds to payout. Back a winner at 4/1 or more and get a risk free bet on the next live ITV race (up to £50) at bet365. Offer applies to first single bet placed. Applies to Win and Each-Way Fixed Odds markets and Enhanced Place Terms markets only. Bet restrictions and T&Cs apply. New and eligible customers only. It is worth noting that the last race each day at Cheltenham is not being broadcasted on ITV. Get money back as a free bet if your horse falls, the jockey is unseated or is brought down. A minimum bet of £5 applies, and there is a max payout of £25 available. This is available for all races at Cheltenham and is probably more useful for the chases, rather than the hurdles. All bookmakers are now NRNB across all races. We’ve included the date when they made this change, so if you placed an ante-post bet, you will know the terms of your bet. 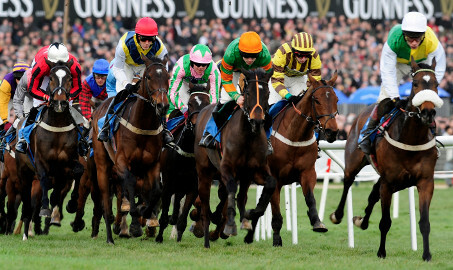 Here is a summary of all of the Cheltenham offers that are available for Gold Cup Day. More details on them can be found in the section above. Take advantage of the Betway money back special for the 1.30. If you don’t win, you’ll get your losing bet back as a free bet which you can use for the next race. Paddy Power are offering money back on all losers if Sir Erec wins. An alternative to the money back specials is Coral, who will double your winnings up to £25. If you don’t start the day with a win, you’ll have 2 x £10 free bets to use later on in the day. Paddy Power and Betway both aim to refund the losing bets within 2 hours. So far, for us, it has taken about an around hour. For the 2.10 you probably won’t have had your free bets awarded yet, so pick either Unibet, bet365 or Betfair. All of these will give you a free bet when you back a winner. For the 2.50 and 3.30, if you didn’t win in the opening race, you likely have a £10 free bet for each of these races. The 4.10 and 4.50 races, you’re back with bet365/ Unibet. For this one, we’d recommend Betway again. It’s the same offer as before; money back as a free bet if your horse doesn’t win. Also worth considering is the William Hill Golden Race competition. Bet £10 and you have the chance to win £1m by predicting the first six horses to finish.